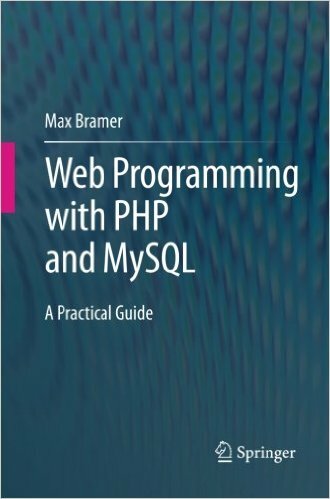 Introductory textbook covering all the main features of the 'web programming' languages PHP and MySQL together with detailed examples that will enable readers (whether students on a taught course or independent learners) to use them to create their own applications or understand existing ones. A particular focus is the use of PHP to generate MySQL commands from a script as it is executed. Each chapter includes aims, a summary and practical exercises (with solutions) to support learning. Chapters are designed to stand alone as far as possible, so that they can be studied independently of the rest of the text by those with some previous knowledge of the languages. There is a comprehensive glossary of technical terms, together with extensive appendices for quick reference of language features. This is a collection in zipped form of some of the PHP scripts used in Web Programming with PHP and MySQL plus some of the text files used for data. Please notify any errors to the author using the website contact form. Contributions are welcome! This is a zipped copy of the directory structure shown at the bottom of Chapter 7 Page 94 of Web Programming with PHP and MySQL, including dummy files, in a form suitable for uploading to readers' own websites. Note that (for obscure technical reasons) empty directory tmp should be added before uploading. These are dumps of four database tables referred to in Web Programming with PHP and MySQL. They have all been exported in SQL format.